When storing flammables it is beneficial to keep your inventory stored in a fire rated flammable storage locker. A flammable liquid itself does not burn, the vapors from that flammable liquid is what actually burns. Vapor pressure, is the rate at which a liquid produces flammable vapors. The vapor density as well as flammability ratings, all depends on at what temperature the flammable liquid is being stored at. A flammable liquid is more hazardous at elevated temperatures than at controlled temperatures. Fire rated storage buildings are stronger and more dependable than regular storage buildings – keep your flammables stored compliantly with a fire rated container. Flammable locker storage requirements by US Chemical Storage offers safe, reliable and dependable storage solutions for hazmat and flammable chemicals. Flammable storage requires temperature controls, depending on the climate in which the building is stored at. Temperature controls can give flammable materials the maintenance they need to remain stable and compliant. When flammable materials, liquids or solids, become heated they can react and become combustible – depending on chemical compounds and features of the flammable material. Flammable materials can become ignited from a spark, so explosion proof electrical accessories are necessary. Refrigeration and freezers may cause sparks so it is important that flammables are not stored inside these units. Flammable locker storage requirements can be different for every chemical that is being stored, therefore researching the chemical and reading the MSDS for each liquid being handled and stored can be very helpful for keeping your chemical storage compliant. Store flammables separate from other chemicals or flammables. Oxidizers and reactive chemicals can cause hazardous situations when stored together. Flammable locker storage requirements consists of keeping flammables in a well-ventilated, and temperature controlled building. The equipment used internally should be explosion proof and non-sparking electrical systems. Fire suppression is necessary in the event of a fire or hazardous situation. 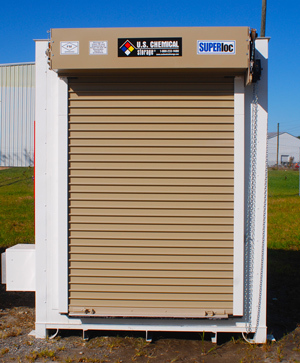 US Chemical Storage fire suppression systems are top of the line, high-quality and extremely reliable. In the event of a fire or explosion, US Chemical Storage fire suppression systems will shut off all air ways, air condition units, mechanical vents and trigger an alarm that will instantly travel to the central receiving station for immediate response from officials. Keep your flammable locker storage safe and compliant with US Chemical Storage parts and accessories. Engineered by professionals and developed with extensive research and development. Our Strength is Your Security.